Actions happen all over the place. Even in outer space! See if you can pick out the robot holding the verb in this fast paced Whack-A-Robot style game! Simply click on Verbs in Space to begin! The Verb Viper is hungry for a snack. 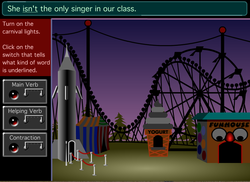 Help the Verb Viper devour a tasty morstle by clicking on the correct verb to complete each phrase or sentence. Make sure that your verb choice agrees with the singular or plural subject provided! This striking game is only a click away at ViperVerb! Some busy bees need your help to spot the flowers that have the correct forms of the "be" verb. This honey of a game allows you to practice finding "be" verbs both in the present and past tense. So, buzz on over to 2Bee or Nottobee to begin! Spin the wheel and test your knowledge at the many past and present tense forms of irregular verbs. Explore the Irregular Verb Wheel Game as an extra challenge as you learn about the many functions of verbs! Light up the night sky as you identify verbs that function as main verbs, helping verbs, or contractions. with each correct answer you will light up one of the exciting exhibits at the carnival. Having Verb Power can be a truly illuminating experience!